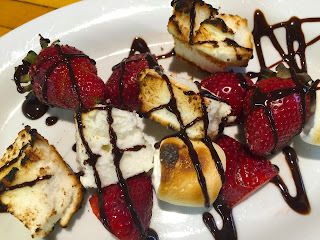 For Mom: Strawberry Shortcake on the Grill | We Like to Cook! Don’t you just hate those Mother’s Day meals where the kids have dreamed up an elaborate menu that has you cooking and cleaning on your supposed day of rest and relaxation? Well, we have you covered this year! This is a kid-friendly recipe that gets them involved, and keeps you out of the kitchen. Kids will love being able to assemble the ingredients on skewers and enjoy eating them even more. This is the time of year when strawberries are in season and abundant in supply. 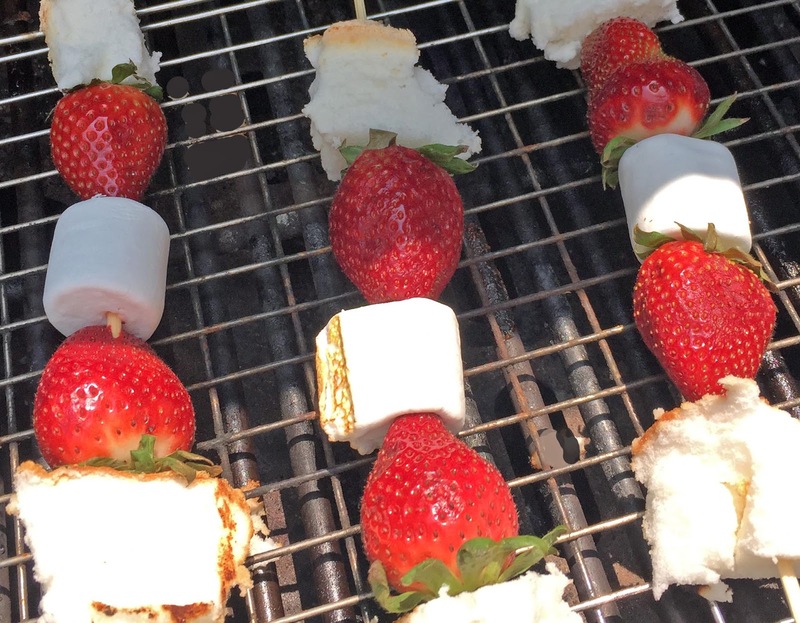 Strawberry shortcake is a perennial favorite, but did you ever think of cooking it on a grill? 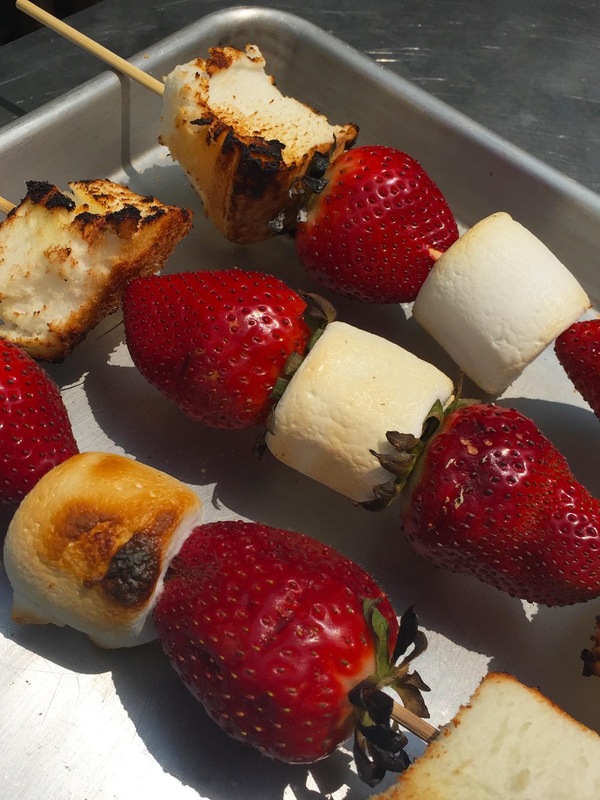 Just like any fruit placed on the grill, strawberries get a smoky caramelized flavor that matches the toasty gooey marshmallows. We think this is going to be your new go-to dessert; impressive for guests and easy for Mom. Preheat your grill to low. If you are using a charcoal grill, you should wait until the fire has died down after grilling your main dish. Rinse and clean the strawberries and remove caps. Kids can help with this using a plastic knife or a straw inserted into the bottom of the strawberry and gently pushed through to the stem which pops right out cleanly. The straw method has an added bonus; the strawberry already has a hole for the skewer. Thread the ingredients on your skewers. We allotted 2 strawberries and pieces of cake and one marshmallow per person, but there are no rules. Skewers can be uniform or freestyle – we won’t judge! Gently place the skewers on the grill. We added an additional rack for easier removal and it added another layer between the skewers and the flame. Turn the skewers frequently to achieve even cooking on all sides. Depending on how hot your grill is, you may be turning constantly. Keep an eye on the marshmallows as they are the most fragile of the ingredients. When your skewers have reached the desired amount of doneness, remove them to a plate. Arrange the skewers on a serving tray and drizzle with chocolate sauce. Enjoy!